Dulce de leche is essentially caramel, but it literally translates to “sweet of milk.” It seems really easy to make yourself, though I have failed on multiple occasions, and I really don’t know why. You’r basically cooking sweetened condensed milk until it thickens and carmelizes… doesn’t sound so bad, right? If you are interested in trying to make your own, check out Bakers Royale post, and I wish you more luck that I had with it! These cupcakes are one of those recipes that I’ve had intentions to make sooner, but for one reason or another, it has been delayed. The first time I wanted to make these was a few months ago. I wanted to be cool and make my own dulce de leche, since it seemed so easy. 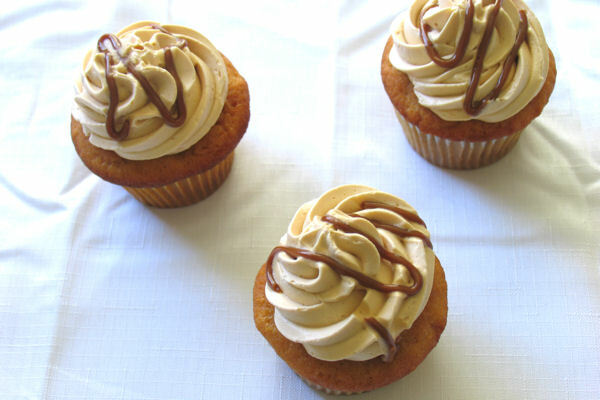 Yet somehow I failed, and without any cans of dulce de leche laying around, the cupcakes had to be put on hold. Then another time I had saved some egg whites, and realized I had the perfect number to turn into a delicious swiss meringue buttercream, but ran out of time and ended up having to quickly freeze the egg whites before they went bad. Finally, I was determined. 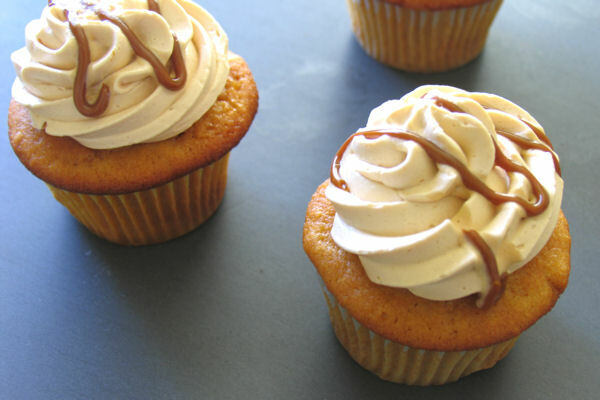 I had the egg whites, I had the dulce de leche, and one way or another these cupcakes were being made! And so I did. And everyone was able to taste the greatness! The cupcakes did seem a little dry and crumbly, though still delicious. I think I might have over baked them. To make the cupcakes: Preheat the oven to 350 degrees F. Line cupcake tins with 24 paper liners. In a medium bowl, whisk together the flours, baking powder, baking soda, and salt; set aside. In a stand mixer fitted with the paddle attachment, beat the butter and sugar on medium speed until light and fluffy, about 2 minutes, scraping down the sides of the bowl as necessary. Add the dulce de leche and beat another minute, until thoroughly incorporated. Add the eggs one at a time, beating well after each addition, then mix in the oil and vanilla. Reduce the mixer speed to low; add the dry ingredients in three additions, alternating with the buttermilk and ending with the dry ingredients, beating each addition just until incorporated. Divide the batter between the prepared cupcake cups, filling each cup about two-thirds full. Bake for 16 to 20 minutes, or until a toothpick inserted into the center of a cupcake comes out clean. Cool cupcakes in the tin on a wire rack for 5 minutes, then remove from the tin to finish cooling on the rack. Cool completely before frosting. To make the buttercream: In the metal bowl of a stand mixer (or a large hat-proof bowl if using a hand-held mixer), combine the egg whites, sugar, and salt. Set the bowl over a pot of simmering water, making sure the bottom of the bowl does not touch the water. Whisk constantly until the mixture reaches 160 degrees F.
Fit the mixer with the whisk attachment; beat the egg white mixture on medium-high speed until stiff peaks form and the bottom of the mixing bowl is cool to the touch, about 8 minutes. Reduce the mixer speed to medium and add the butter 2 tablespoons at a time, adding more once each addition has been incorporated. Increase the mixer speed to medium-high and beat until the buttercream is thick and smooth, 3-5 minutes; it may seem to curdle but keep mixing and it will come together. Add the dulce de leche and vanilla; mix until incorporated. 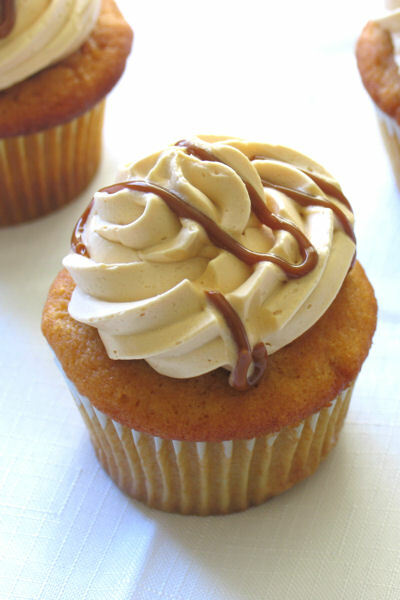 Frost cupcakes as desired, drizzling with any extra dulce de leche. Well done, Stefanie! These look incredible! That is a great recipe. I love dulce de leche and your recipe is one I’ll be making very soon. These are just beautiful! I love dulce de leche and I’m excited to try this! Ooooooh…doesn’t that just look yummy!